(Yes. I call myself ‘waddles’. ‘Preggo’ and ‘preggers’ are also often used. Most often when talking about food, for example, “Preggers wants cake!” or “Preggo wants a hamburger!” I’m classy. )So we had our home visit yesterday, conducted by my primary midwife and her student. My fundal height was 37 weeks, June Bug’s heart rate was in the 130s, and the student was surprised to palpate him/her even lower than last week! Everything is progressing nicely, and they gave us some hints and tips for how we need to organize our bedroom and such for the impending birth. It was quite fun to have them here! I’m definitely looking forward to each of them being a part of the birth! My primary suggested that, if I was comfortable with the idea, I treat the student as my ‘primary’ for when I call to say I’m in labour – she’ll then assess me, give me some advice, call my primary to confirm with her, and then call us back to say that my primary agreed with everything. Sounds good to me – I know what it’s like to be a student who’s close to the end … it’s nice to be treated like the competent health care professional that you are. The white dresser will we replaced by a larger wooden dresser hopefully early next week =) Crystle is going to refinish the top of it before giving it to us – thanks! 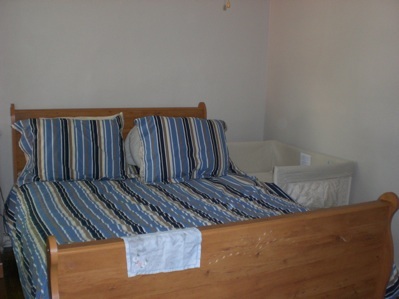 The room will be primarily used as a changing area until June Bug’s done sleeping with us. I will probably put him/her down for some naps in here, too, once the crib is set up. Set up next to our bed … I love looking at it!! It’s so big and yet so tiny. I must admit … I put a onesie in there when we first set it up to see how small June Bug would look in it. So. Cute. And, in my quest to leave as few footprints on our planet as possible, I ventured into the realm of cloth wipe making =) It was suggested that I find old flannel shirts … but I decided after going cross-eyed with all that plaid at the thrift store, I’d check out the pj’s. Much better selection! Way to go Kim – they’re awesome! I should post a pic of the blanket I made for him – it’s a Canada hockey one! Waddles, classy, putting the onesie in the bed – you’re too cute/funny! LOL – thanks Tammy!! Do post a pic of the blanket – I wanna see it! i love june bug’s room. 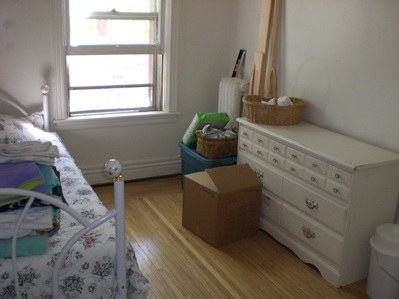 its sooo cute seeing that dresser again. the co-sleeper doesn’t look like what i thought it would, but i can see why you are loving it so much. 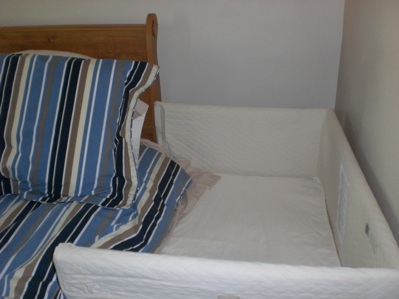 when we first set up the crib i put a onsie in it too – doesn’t it make it seem so much smaller? LOL – I’m glad I’m not the only one who put small clothes in the bed … it’s so exciting!!! I can’t believe I’m this close, either. I’m getting anxious to find out who’s in there! 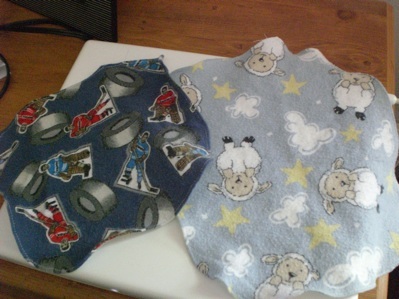 I am still using the same homemade cloth wipes almost 3 years later. They are very faded, but still in great condition. I plan on using them with this baby. It is a great investment, I love hearing of other mama’s doing stuff like this! Good for you!! 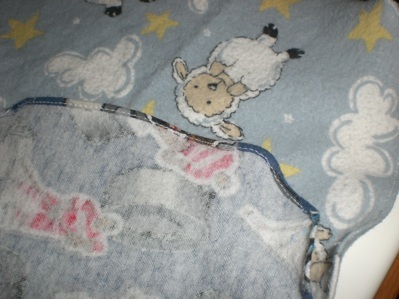 I find I like the cloth better anyway, much more stable. okay you guys are making me want to do this too – what a great way to save money & cut down on waste. this weekend i’m going to start shopping for some flannel pj’s. thanks for the motivation!! Yay!! Glad I could convert you ;)! Anytime!